New vehicle pricing includes all offers and incentives. Tax, Title and Tags not included in vehicle prices shown and must be paid by the purchaser. While great effort is made to ensure the accuracy of the information on this site, errors do occur so please verify information with a customer service rep. This is easily done by calling us at (765) 323-4603 or by visiting us at the dealership. **With approved credit. Terms may vary. Monthly payments are only estimates derived from the vehicle price with a 84 month term, 4% interest and 10% downpayment. Diamond Black 2019 Jeep Cherokee Latitude Plus 4WD 9-Speed 948TE Automatic 2.0L I4 DOHC Cherokee Latitude Plus, 4WD, Diamond Black, Black Cloth, All-Season Floor Mats, Cold Weather Group, Engine Block Heater, Heated Front Seats, Heated Steering Wheel, Quick Order Package 2YD, Remote Start System, Windshield Wiper De-Icer. When you visit our Crawfordsville new and used Chrysler, Dodge, Jeep, FIAT, and RAM dealership we aim to make you completely satisfied. From our low prices and to our wide selection of high-quality vehicles, York Chrysler Dodge Jeep Ram FIAT is the first and last car dealership you will need to shop for a new or used car. 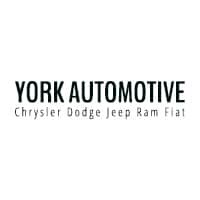 York Chrysler Dodge Jeep Ram FIAT	40.0145309, -86.9050651.